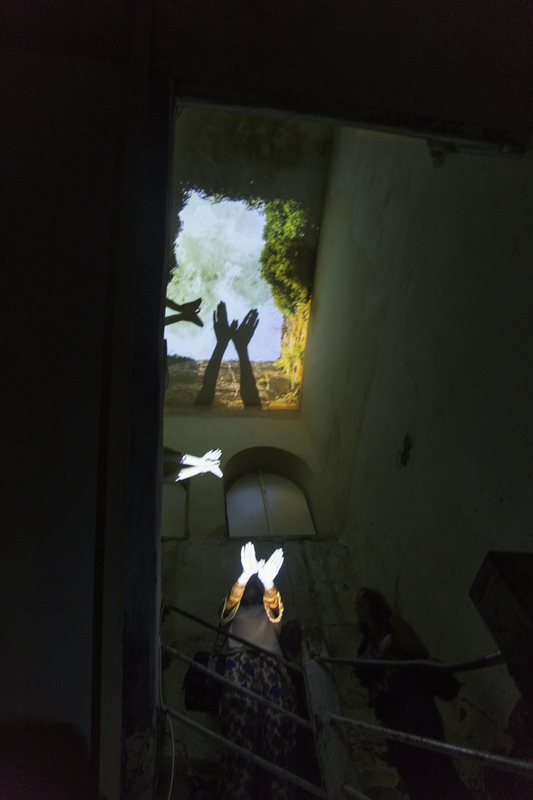 A video and audio installation made site-specifically for the 2012 Sinopale biennial in Black Sea fishing town, Sinop, Turkey, which invites temporary installations in response to the decommissioned prison that sits at the former entrance to the city. I Have a Dream of a Different Army was one of two pieces made during a two-week residency in Sinop, alongside Thunderstorm on a Clear, Bright Day, a short essay film. Both works inhabited the central stairwell of the prison’s children’s wing, following a study of the prison’s architecture, the visual relationships between its inside, interviews with people who had been imprisoned there in the years of the 1980 military coup d’état, which targeted intellectuals and student activists, and a visit to prison that has since replaced it. “I Have a Dream of a Different Army” included a ceiling projection, showing the view of the sky available in an obscure corner of the prison that had been an early part of the ancient fortress in which this prison had been built, and three small speakers set into the walls of the stairwell, playing interviews with a former local prisoner, the recitation of a poem by another former prisoner, and an interview with an advocate against the prison industrial complex in the U.S., so as to place their conversations in a comparative relationship.